Myrrh Powder has been used medicinally for over 2,000 years because of its believed antiseptic, detoxifying and anti-inflammatory properties. It is very popular in soap and facial masks as it is believed to reduce blemishes while calming and rejuvenating tired skin. Cut up and melt 24 oz. honey soap in large measuring cup in microwave. Pour 2 oz. of melted soap into small measuring cup. Whisk in myrrh gum powder until there are no clumps. Add back to remaining soap and stir well. Fill each soap mold cavity to the top and spritz with rubbing alcohol. Allow to harden. Remove from molds and wrap with plastic wrap. Ingredient Label: Sorbitol, Coconut Oil, Propylene Glycol, Stearic Acid, Water, Sodium Hydroxide, Glycerin, Honey, Fragrance, Myrrh Gum. "Why is the recipe in the Handmade Magazine different from the one with the kit. The one in the magazine does not have you make a clear layer first, followed by the myrhh layer. I made it according to the kit, and it does not look attractive to have the two layers, and you'd have to turn the bar over to get the benefit of the myrhh. Will the clear layer darken and the bar look more "whole?" "
Staff Answer The recipe on the website was made back in 2014. 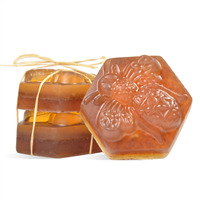 The soap was made in this way to highlight the beautiful golden honey color of the soap. The bottom darker layer complimented the first layer. The myrrh gum powder we now carry is much darker. We remade the recipe in the same way but it did not look quite as good as the original. That is why the recipe in the magazine was done differently. We do not think the soap will darken. "I just made this and the top was clear (I understand this will darken over time), but the bottom layer (where you add the myrrh powder) is practically black. I even cut the second batch to one teaspoon of myrrh. Still black. Am I missing something here? How can I make both layers closer to golden? (Maybe time for the first layer!) 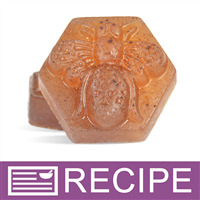 :)"
Staff Answer Since Myrrh Gum Powder is a natural product it does vary in color. You may want to try just a small amount in your product to keep it closer to the honey color you are are looking for. "Do I have to worry about the bars sweating while they are curing for 7 days? " Staff Answer You should not have an issue with this sweating. If you are in a humid climate, they may sweat slightly but should dry within the 1-7 day period. You can also spritz with alcohol and wipe with a paper towel if you do experience some sweating. 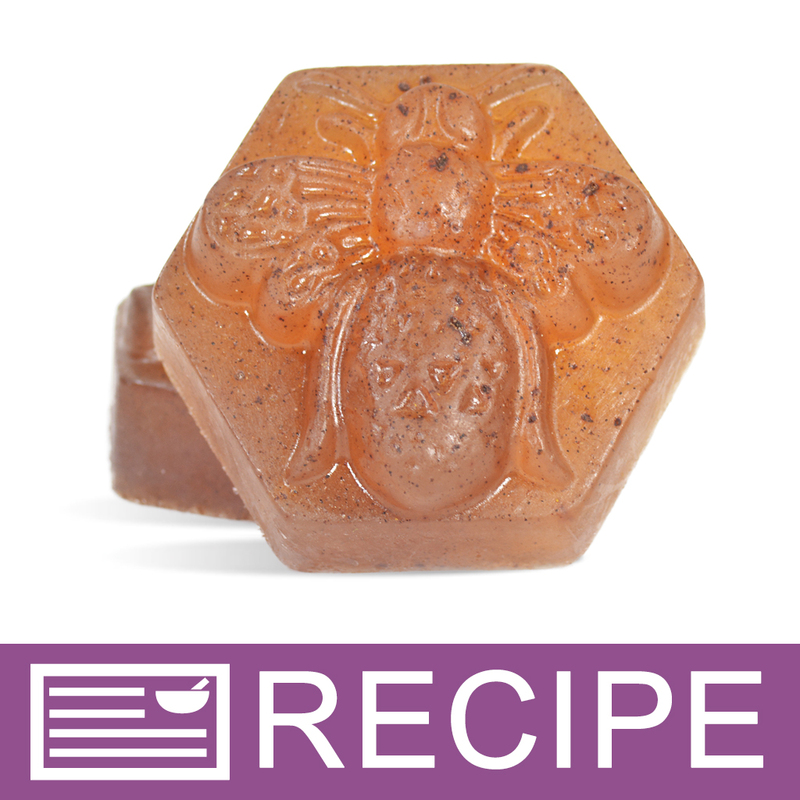 "Hi...How do I make this soap with honey and the shea butter base? Do I add half of each base? Please help...thanks"
Staff Answer Hi Natalie, you could use half and half. It will greatly change the overall appearance of the soap. It will be an opaque off-white color versus a semi-transparent honey color. "Could a dry facial clay powder be added to the Honey Facial bar recipe and if so, how much do you recommend? " Staff Answer Yes, you could add a facial clay to this bar. How much you use will depend on the clay. If you are using one of our clays we provide the common and recommended usage rates for each one. You will need to test your finished product to ensure compatibility. You will also need to adjust your ingredient label to include and additions to our original recipe if you are selling this product. "What would the shelf life on this product be? Would shelf life be increased if stored in sealed container?" Staff Answer The shelf life for this product is 1 year after manufacture. We recommend that these soaps be stored at or below room temperature in a dry place. They can be wrapped for added protection. For use they should be allowed to dry completely between uses to extend the life of the product.